A new year has just started to unfold for us and we are really excited with all the new possibilities. We see our vision growing and our message spreading and we feel rewarded for all the hard work we have put into our beloved www.streethunters.net. One of our most active and exciting series is our Monthly Theme Contest series. This year our Monthly Theme Contest series will change slightly. Firstly the calendar at the end of the year is being canceled because we have noticed during the past 3 years that we have been doing this that the calendar didn’t really matter. Nobody was interested in it. So, bye bye calendar! Instead of doing a calendar we will be releasing a video with a presentation of the winning photos and photographers that will be released on our Youtube channel that has 10K subscribers and is constantly growing. Secondly, the prizes are changing this year. Instead of giving away COSYSPEED Camslinger bags, we will be giving the winner EXPOSURE! At the time of this writing our website averages around 1500 to 2000 views a day. In 2016 alone we had more than half a million views and this year we would like to double that. So, as a prize we will offer the winners an exclusive presentation of their work on our website along with an interview. This presentation will also be made into a video slideshow and uploaded to our YouTube channel. So the amount of exposure will be great for all the winners, not only will they be getting the page announcing them as winners as they do now, but also they will have a special feature post and video feature. 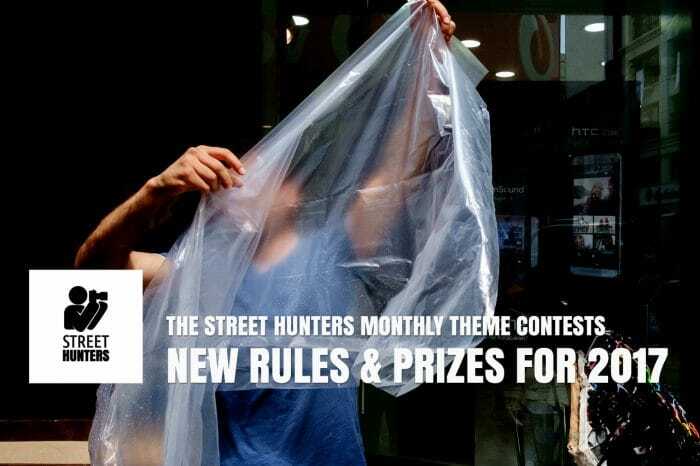 We think this prize is very valuable because the feature posts will remain on the web for as long as Street Hunters exists, being a way for other street photographers to discover the work of the winners. Of course this means that a photographer can only win and be featured once during 2017, giving the opportunity for 12 different Street Photographers to be featured on our website. Before I continue, I would like to thank COSYSPEED for sponsoring our 2016 Monthly Theme Contest series. We really enjoyed our cooperation and look forward to new things in the future! Thanks COSYSPEED! Moving on, the photo selection process isn’t going to change. We noticed that eliminating the poll that we used in the past makes the whole process much smoother and we find that the winning photos are more aligned with our taste. So, Andrew, Digby and myself will be choosing the winners again this year. We are really looking forward to seeing what photos you will be sending in this year! We highly recommend you start setting goals and getting organised because some of these Themes will need a lot of work. The official announcement for the Zebra crossing theme is coming right up! Winner of the December 2016 Street Photography Contest! It’s great that our submissions don’t always have to be in landscape mode this time too. How do I submit a photo for the contest? You can send 1 photo to contact@streethunters.net. The photo has to follow the requested guidelines.